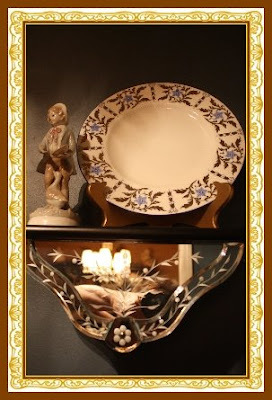 BARGAIN DECORATING WITH LAURIE: WHERE DO YOU STORE YOUR PLATES? WHERE DO YOU STORE YOUR PLATES? 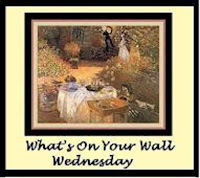 Today, I'm participating in What's On Your Wall Wednesday, sponsored by our fabulous hostess, Barb at Grits and Glamour. Barb, thank you so much for sponsoring this weekly event. I not only keep china in my cupboards, I keep it on my walls too. Well, you know Gullom (Designs by Gollum) stores beautiful, expensive china behind her draperies, so my bargain china on the walls doesn't sound so bad, does it? why we have plates hanging on the walls. For awhile, after I started hanging plates on the walls, when I would give him dinner, he'd look around suspiciously and then ask if I had taken a plate off of the wall. He just knew I was going to feed him dinner on a plate that had dust bunnies on the back of it! Hmmm, do these look familiar? If you enlarge these pictures, I just want you to know that your computer screen is dirty, not my plates! Be sure to go see all of the beautiful treasures on the walls of other Blogvillians. You can get the links at Grits and Glamour (You are going to love the wall decor that Barb is featuring on her blog today). 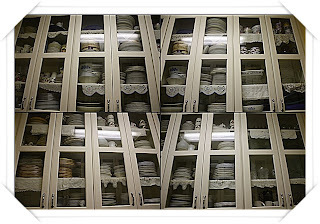 Just thought I'd better show you that I do have a few plates in cabinets! We do not eat off of the ones I have on the walls (or if we do, I wash them first!) I didn't put upper cabinets in my kitchen, so I set aside a space for a walk-through china pantry. Unfortunately, I am even running out of room in there! Can you say "Laurie, you have a problem"! I know... you already said it! (a): a person held to resemble the so-called walking dead ; (b): a person markedly strange in appearance or behavior. That's sounding a lot better than my description of this award! It is a "world-renowned" award! Of course, you know me, I am going to risk the wrath of the zombie chickens (just let 'em try to come after me!). However, it does say that if I choose unwisely, I am risking the zombie chicken wrath. I think it would be unwise to choose any 5 blogs that I visit, because all of the blogs I visit are worthy. I don't visit a blog unless I think the content of that blog is remarkable, so if I have left two or more comments on your blog, that is an indication that I believe your blog content to be remarkable enough to risk an attack of zombie chickens to go read your blog. I further believe that you are worthy of this prestigious award, so please take it with you. Susan, thank you so much for this honor. I've had a great time with this award. I suspect that all of you already visit Susan's beautiful blog, but if you don't, you are missing a wonderful treat, so get right over to A Southern Daydreamer and check it out! I am honored to have again received the Attitude of Gratitude Award. Although I've received it before, I am so pleased that Lorna at Lace and Ivy Cottage thought of me when she handed out this award. If you've never visited Lorna, you need to go right over to her blog. She has such wonderful and beautiful ideas. I don't know how she even has time to think, much less come up with great ideas, since she has a gazillion beautiful children (I really think it's ONLY 7, but that would feel like a gazillion if they were at my house!) Thank you so much Lorna. very funny about hubby looking for missing plates! You have more storage in your house than I have ever seen, it's my dream home! Love all your plates and I want your pantry! Congratulations on all of your awards! You certainly deserve them all. Have a wonderful day! If I had a "Queen of Plates" award, I'd give it to you Laurie! Cool plates!! Funny about your husband's comments. Oh MY! Your pantry cupboard full of dishes --- you are living my dream. I have dishes everywhere ... I am now using the ruse of claiming to acquire them for my daughters; I should have had more kids. GREAT post, love the dishes! Laurie, you deserve awards. You put your whole self into your blogs. I really enjoy reading all of your entries! I have four sets of china and a Christmas set and have nowhere to store them. I keep the Christmas ones in the basement. and two sets in my china cabinet, one in kitchen cupboard. I am a dishaholic but have no hiding spaces! 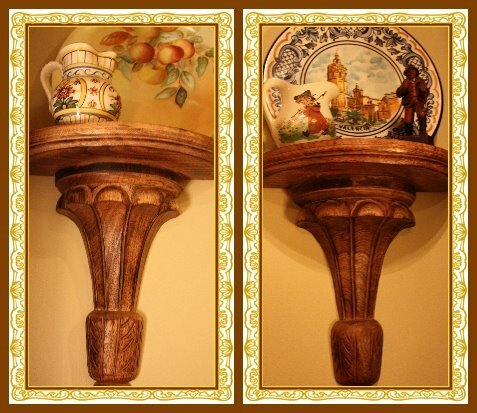 Like your plate racks and dishes too! I have plate storage envy!!! I love that wall-o-china. I would kill (ok maybe not kill but badly injure) to have an area like that. Yes, I am pretty much like Gollum. Dishes, dishes, everywhere dishes. sigh! I love it when deserving people get awards. 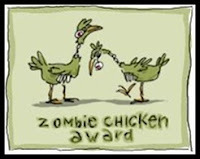 Even zombie chicken awards. LOL You are one of my bestest followers and I enjoy your blog, as well. Love your plates. Larry doesn't understand hanging plates on the wall either. I have them in my kitchen, on my screened porch, in a bathroom, and in one upstairs bedroom. If I had my way, I'd hang a few more as well. Maybe I will. You've inspired me. Oh yeah, I'm now suffering from some serious pantry envy! Geesch, I have a small stack of plates on the counter as we speak that need a new storage spot & I'm not sure where I'm going to find that spot! Oh, and be sure to tell that hubby he's the best! intervention... Wowser Laurie, I have hesitated to post my plates. YOU WIN!!! I Love them all and am clearing a space as we speak. Laurie, your posts are always worth a good belly laugh and I am dizzy jealous of your plate collection! Oh my, love, love, love them all! I don't have any on the wall, but my dh asks "which one of your plates are we using now?" Can you believe it, he wants to know the pattern name and who made it! Your china pantry is to die for...I have china stored in the kitchen, dining room, hall cabinet, living room and bedroom. You have lots of fabulous plates. I've run out of room to store plates at my house. I still have my Easter plates stacked on my table trying to figure out where I can store them that I'll actually remember where they are next year when I want to use them again. I'm notorious for putting things away & forgetting where I put them when I need them again. And I'm not even that old yet. You do have quite the plate collection and I love them all! Laurie, you are not strange!! 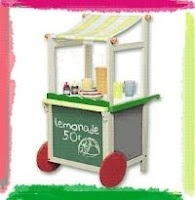 You are so funny, and I enjoy reading your post very much!! You are very deserving of many awards. You are sooo funny! Zombie chicken plate lady!! Congrats on your award, hehe! You always put a big smile on my face every time I read your posts! Laurie, that's not a problem honey, it's a healthy addiction! :) I love all your plates. i want that pantry.i love it.truth be told honey.all of us could fill it up quickly.and look at Susan and Gollum,wow.I'll bet you can't catch them,think about it that way.